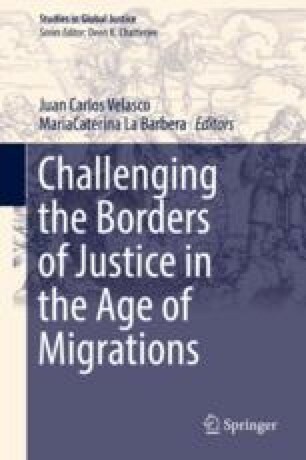 The chapter develops an approach to the articulation of migrants’ claims and, in particular, gendered claims for global justice. This approach embeds the cosmopolitan critical theory of global justice in people’s everyday critique of structural injustice. The author builds on critical theory, especially that advanced by Axel Honneth, Marek Hrubec, Iris M. Young and Ulrich Beck, and on the critical analysis of global capitalism presented by William Robinson and Leslie Sklair to articulate migrants’ struggles for recognition and to situate transnational migration practices in the context of global interactions from which these practices arise. The author argues that by limiting our understanding of the transnational subject of justice claims to only organized political collectivities, one overlooks a significant component of social protest. She elaborates a concept of lived critique and challenges the understanding of the agents of global justice claims as individuals or transnational organized collectivities. She argues that although migrants’ lived critique does not take the form of traditional political protest, understanding marginalized migrants as a structural group allows cosmopolitan critical theory to identify more seriously based and more ambitious claims for global justice. The author suggests that the migrants’ lived critique contests the legitimacy of global capitalism and of the nation-state-defined institutional and legal framework. Finally, she highlights the lived critique of marginalized groups of migrant women and articulates gendered claims for the social recognition of care and transnational social reproduction as a matter of global justice. ILO. 2011. Convention Concerning Decent Work for Domestic Workers. http://www.ilo.org/wcmsp5/groups/public/@ed_norm/@relconf/documents/meetingdocument/wcms_157836.pdf. Accessed 4 Dec 2016.